Card Designer Joan Morrison has made these cards featuring dies from Sue Wilson's Austrian Collection. Once again, she demonstrates how using different dies in the set in different ways can create such different and beautiful cards. or standing up to open from the side. then layered and and mounted on the card for dimension. 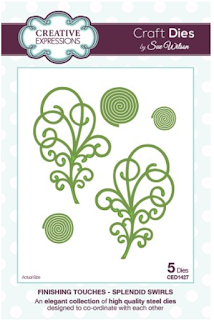 and just cut the decorative oval design right into the cardstock. paper for random accents on any card. This card is simple yet strikingly beautiful. Only 1 die from the Innsbruck set was used to cut right into the cardstock. lightly shaped and embellished for detail. Wow. The picture does not do this card justice. A beautiful pink glitter backing really makes the decorative inner oval pop! and Cheery Lynn B178 Leaf Flourish. Also featured is the Petite Peony Cluster die CED1451. as soon as they are available from my supplier I will get them to you. Sorry, I do not have a date as to when they are expected. in the middle of this spectacular background die. NOTE: This die does not have an outer cutting edge..
can be with Creative Expressions by Sue Wilson dies.